With more than 100 events at over 30 locations throughout the Downtown Eastside scheduled over twelve days in this year’s Festival (October 26 – November 6), choosing what to see and hear becomes a delightful challenge. 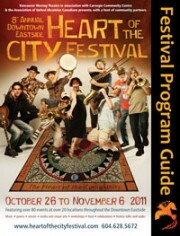 Here are our “Terrific Twelve” Top Festival Picks for 2011! 12. Oppenheimer Art Show and Parade: At Our Kitchen Table: It is an honour to include in the Festival the 4th Annual Oppenheimer Park Community Art Show. The first art show helped to bridge the community through the transformations of a pre-Olympic city and redevelopment of the Park. Today Oppenheimer Park remains a community of people upholding the Park’s vision as a place for art, education, recreation, health and healing. The art show features works by new, emerging and established artists that reflect the vibrant and creative community in and around the Park and offers a unique perspective into the heart and home of the DTES. Join artists, community members and neighbours in an early evening parade from Oppenheimer to Gachet, led by Brad Muirhead and the Carnegie Street Band.